You know how I have been moaning all year about how the Monday Night Football schedule has been atrocious almost the entire season? Well, I have good news and bad news for you this week. The bad is that as awful as last week’s Jaguars-Chargers matchup was, at least there were a few big-name stars in that one in San Diego QB Philip Rivers and Jacksonville RB Maurice Jones-Drew. And the Chargers are at least still somewhat nationally relevant. This Monday’s game between St. Louis and Seattle features probably no player that a casual NFL fan would recognize. In fact, five bonus points right now if you can tell me at which college the Rams’ likely starting quarterback be this week played (more on that below). The books have to hate this because fewer viewers means less action. And last week’s game drew a 6.9 national overnight rating on ESPN, the lowest MNF rating of the season. I’d be willing to bet this one goes lower. Here’s the good news: the final two MNF games of the season after this one (no MNF in Week 17) are terrific: Steelers-49ers and Falcons-Saints. As usual, I will start with the key injuries, and for St. Louis it’s pretty grim at quarterback. Reigning Offensive Rookie of the Year Sam Bradford sat out the Rams' 26-0 loss to the San Francisco 49ers last Sunday after aggravating the ankle injury that kept him out of two games earlier this season. It doesn’t seem likely that Bradford will return. He has had a terrible year when in there and with the Rams at 2-10, there’s really no need to risk further injury to the franchise player. Backup QB A.J. Feeley suffered a small fracture to his right (throwing) thumb in the loss to San Francisco. Feeley, who also started the two earlier games Bradford missed, played the entire game but was awful, going 12-of -22 passes Sunday for 156 yards as the Rams never even got to San Francisco’s 35-yard-line. Thus, I introduce you to third-string QB Tom Brandstater. The former sixth-round pick out of Fresno State (not by the Rams) has never played in a regular season game and was elevated from the practice squad shortly before the 49ers game. It looks like he may have to go Monday night. And Brandstater won’t have a key lineman to protect him as left guard Jacob Bell, the only Rams' offensive lineman to still be playing the same position he was in Week 1, suffered an MCL sprain Sunday and is likely done for the year. At 5-7, the Seahawks still aren’t mathematically out of the wild-card chase (San Francisco clinched the NFC West last week). The Seahawks have improved of late, winning three of four. They should be well rested, having last played on Dec. 1 in thumping the Eagles, 31-14. Unfortunately for the Seahawks, they lost left tackle Russell Okung, last year’s top pick, for the season in that one with a torn pectoral muscle. That made him the third starting offensive lineman to go down in the last month. Paul McQuistan will move from right guard to left tackle to take over for Okung, while Lemuel Jeanpierre will move in at right guard. The offensive line has opened some big holes for Marshawn Lynch of late, with Lynch being arguably the top back in the NFL during the hot streak. Lynch ran 22 times for 148 yards and two touchdowns against the Eagles for the second-highest rushing total of his career. He’s now scored a touchdown in eight straight games. It was Lynch's fourth 100-yard game of the season with all of them coming in his last five outings (he is earning himself big money as a free agent after the season). Seattle has topped 100 yards rushing in five straight games, its longest streak since the 2005 season. If Seattle can top 100 yards rushing again this week, it would be the longest single-season streak for the team in 15 years. Lynch's worst outing in the past five weeks was his 88 yards and a score against the Rams in Week 11. Since then St. Louis has allowed 329 yards to running backs in two weeks. The Rams are No. 32 in the NFL in rush defense, allowing 157.8 ypg. Back on Nov. 20 in St. Louis, the Seahawks won 24-7. Bradford actually played in that one, going 20-for-40 for 181 yards with a TD and a pick. Rams RB Steven Jackson had 42 yards on 15 carries to end a run of three straight games of 125 or more yards. St. Louis was held to 185 total yards. Most books have this off the board due to the Rams’ QB situation still not clear. I have found the line at Seattle -4.5 with the total at 39.5 at a few books. So I will work off that one even though it could certainly move. St. Louis is 2-10 ATS this season and 1-5 ATS on road. Seattle is 7-4-1 ATS this year and 4-2 ATS at home. ‘Over/under’ records: STL 4-7-1, SEA 7-5. The Rams are 1-6 ATS in past seven vs. teams with a losing record. They are 2-7 ATS in past nine following a loss. Seattle is 3-0-1 ATS in past four MNF games. 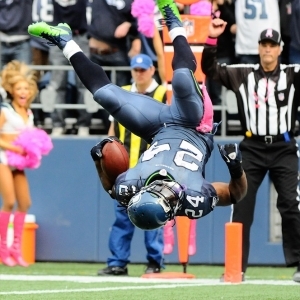 Seahawks are 4-1-1 ATS in past six following an ATS win. The ‘over’ is 9-2 in Seattle’s past 11 following an ATS win. The ‘under’ is 4-1-1 ATS in past six in this series. The Rams haven’t covered in past four trips to Seattle. Are you aware that the past four Monday night games have all been decided by 24 points or more? Pity ESPN. I doubt this one as quite that big of a blowout, but I can’t see the Rams scoring much behind Brandstater. Both teams have good running backs so expect plenty of running and the clock to keep ticking, thus shortening the game and likely equaling fewer points. Take Seattle in a score similar to the first meeting and the ‘under’.